I just came across your book marked roughly 2 months ago and I loved it. If I had more time to read I wouldnt have just finished reading betrayed. I've been way to excited about your next book so I will know what happens next. I have a hard time finding books that can keep my intrest but thats no problem with your books. till then I'm indulging in your fantasy books. you keep writing and i'll keep reading. 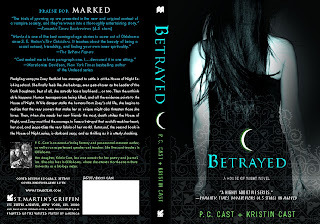 I read Betrayed first and it was amazing. I love how you developed your characters and your story line. You had me from the first chapter. I read Marked second and read the entire book in one night. I just couldn't stop reading it. It was so amazing and powerful. I truly hope that you are able to do two more books after Chosen and Chosen comes out early. That would be awesome!!! Warm regards and Happy Holidays!!! I have read your book Marked three times and I think that betrayed will be just like it. Maybe I will get it for Christmas. Merry Christmas every one here.